Matt Napier is passionate about fighting global poverty—and is undertaking an ambitious walk this summer across southern Africa to raise funds and awareness for the world’s neediest people. Matt recently chatted with The Life You Can Save via email, and shared his thoughts about the global community’s responsibilities to the extreme poor, and how Peter Singer’s philosophy transformed his personal outlook. The Life You Can Save: Matt, thanks for taking the time to speak with us. You’re currently planning a walk across four countries in southern Africa in an effort to help some excellent charities combat global poverty. Tell us about your plans, and about the charities that inspired your walk. Matt Napier: In June I will be setting off on a 2250-kilometre walk from the west coast of southern Africa to the east coast. I will be passing through Namibia, Botswana, South Africa, and Mozambique. The main purpose of my campaign Walk to a Better World is to raise awareness about poverty and to highlight the obstacles the world’s poorest face on a day-to-day basis. 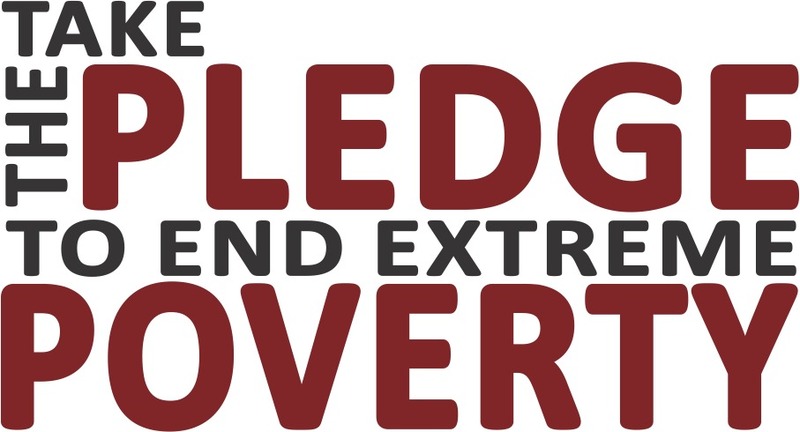 I will be encouraging my supporters to pledge at least 1 percent of their income to help end extreme poverty through the online pledge on our campaign website. In terms of median income, Australians are among the wealthiest in the world, so we need to be doing our fair share to ensure that every man, woman, and child has access to food, clean water, education, and basic healthcare. I have teamed up with four fantastic charities that are leading the way to ending extreme poverty through sustainable development, and in doing so, ensuring a brighter future for the world’s poor. They are Care Australia, Caritas Australia, Oxfam Australia and The Fred Hollows Foundation. TLYCS: You’ve previously cycled and walked long distances to raise awareness for international poverty, both times in your home base of Australia. Tell me what those experiences were like. Matt: Yes, this is not the first long distance challenge I have done to raise awareness of global poverty. In 2012 I cycled across Australia, and in 2013 I walked 4,500 kilometres from Perth to Sydney, via Adelaide and Melbourne. 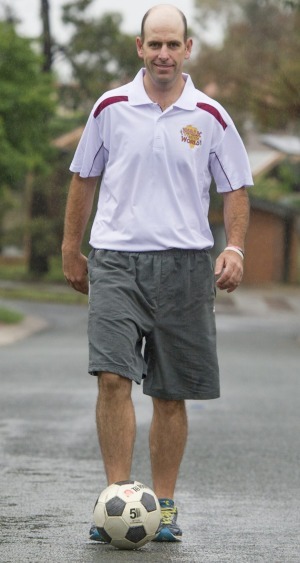 The walk took five months to complete and I bounced an Aussie Rules football the entire way. I walked in temperatures ranging from 45 degrees right down to minus 8 [Celsius]. Both journeys gave me a great opportunity to talk to thousands of school children about global poverty and how important it is to be an active global citizen. I also spoke to members of parliament about how Australia should be doing more to alleviate extreme poverty—instead of cutting the aid budget as we have been doing over the past few years. TLYCS: Peter Singer is one of your campaign ambassadors for Walk to a Better World. How has his work influenced your thinking about international poverty? Matt: It is fantastic to have someone of Peter Singer’s ilk on board as an ambassador for the walk. I first came across one of Peter’s books not long after I returned from a trip to Nepal to visit a friend of mine. It was the first time I had seen extreme poverty firsthand. Children as young as four and five where begging on the streets for food, and people were literally dying of starvation and disease right there on the streets. On the flight back home to Australia I thought to myself, Why should I be so lucky to go back to Australia and lead my privileged life here and leave these poor people behind? The only difference between us was the country we were born into. On arrival home a friend thought I would find Peter’s book The Life You Can Save an interesting read. I resonated very much with his philosophy and have changed my life completely. My wife and I now live a very basic lifestyle and donate 50 percent of the profits from our business to charity. We are currently working on incorporating what we have learned from Peter’s latest book The Most Good You Can Do into making sure that we have the most impact as possible through our charitable giving. 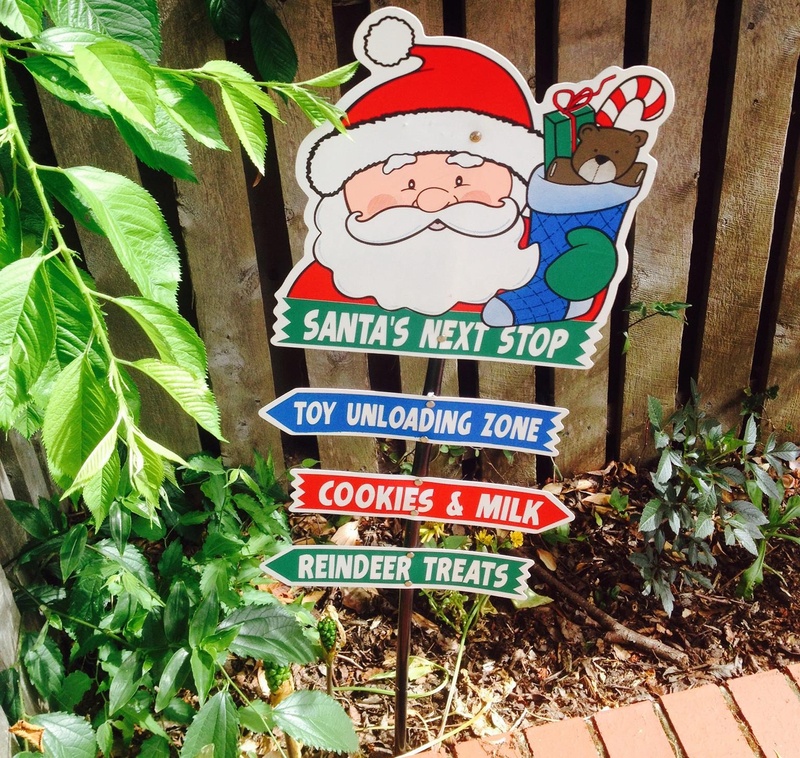 This was very much the inspiration for the research I undertook before selecting the Charity Partners for my walk. Most importantly though, we have never been happier or felt more fulfilled and thank Peter greatly for being such a great influence in our lives. TLYCS: All 10 of the countries with the highest rates of poverty are located in sub-Saharan Africa, and one in three Africans are chronically undernourished. How do you think your trek will change your views of extreme poverty and the people who support themselves and their families such small sums? Matt: It saddens me greatly to know that one in three children in Africa are chronically undernourished but yet so many people in the developed world turn a blind eye to it. I am planning on spending time in villages along the way to get a better understanding of poverty, and I’ll be making a documentary that aims to show the human side of extreme poverty and the effect it has on families. We need to tell stories that viewers can relate to in their own lives, if we’re to convince more people to contribute funds to combat global poverty. I am expecting this walk to be a real eye opener for me. I am sure the walk will only make me want to be more of a voice for the world’s poor as we fight for equality in this world. One of the main things I want to get out of it is sharing the message that we are all human and that we should be leaving no stone unturned in helping the world’s poor break the poverty cycle. We have done some fantastic work by halving the number of people living in extreme poverty since 1990 but there is still a lot of work that needs to be done. TLYCS: You’ll be kicking a football—what we Americans call a soccer ball—along the entire distance of your trek. What was the inspiration for that? 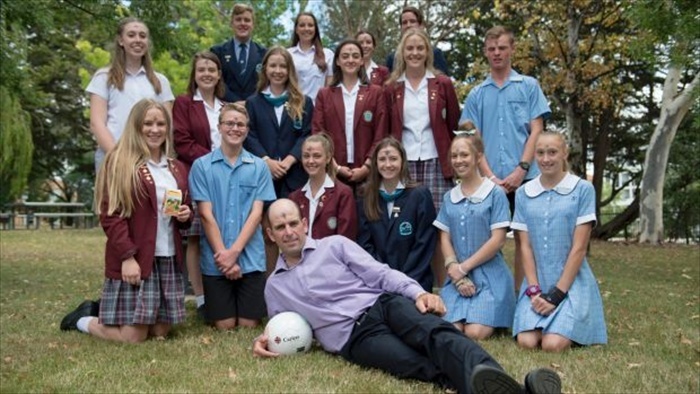 Matt: I believe sport can play a really big part in alleviating extreme poverty. It brings people together from all walks of life on a level playing field, so I like to incorporate sport into all my awareness raising campaigns. It will also be a fantastic way of connecting with communities I pass through on the way. 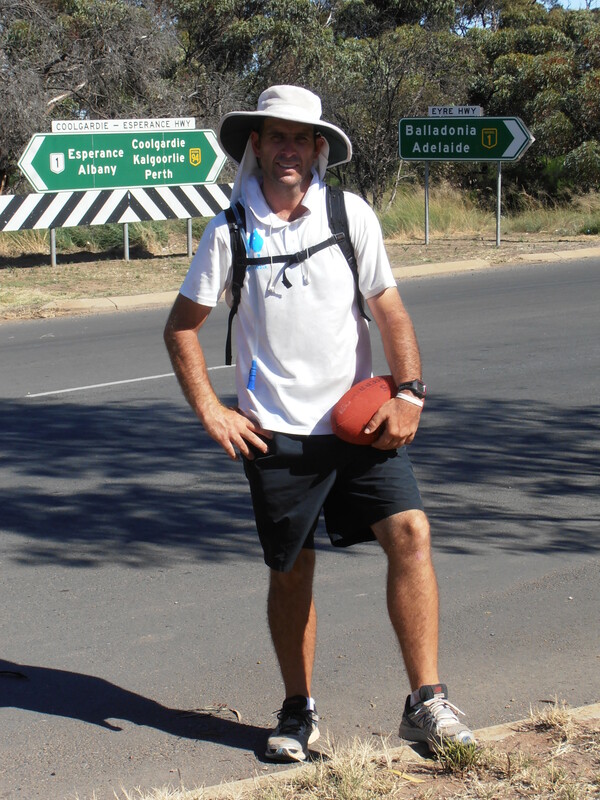 On my walk across Australia in 2013 I actually bounced an Australian Rules Football the entire way. It helped on the long and lonely days having something to take my mind off the walk and also helps in gaining media attention as well. TLYCS: Thanks so much, Matt! I wish you all the best for the upcoming journey and thank you for being part of the movement to end extreme poverty. Matt: Thankyou for supporting Walk to a Better World. What I stand for… will you join me? says the author Scott Weathers a Global Policy Associate at IntraHealth International. This is exactly what I am about! I want to show others that we are making a difference in the level of poverty in the world – numbers have dropped over the past 20 years and will keep dropping if we invest in the correct programs to empower locals to create their own sustainable change. I want to inspire others to really research the ‘effectiveness’ of the charities that they donate to and to understand that by doing this we can continue to make a difference. The only difference between those living below the poverty line and us in the western world is the country that we were born into. I know that I didn’t do anything special to deserve the privilege that I was born with and therefore feel compelled to share these benefits with those not as fortunate. Australian Aid is one thing that really bugs me. The cuts to the Foreign Aid budget have had a devastating effect on the projects we have been running overseas. These programs have helped transform communities and saved thousands of lives. It begs the question, why would you cut aid to a program that is so successful. Why should we in Australia cut our foreign aid budget to try and help balance the budget? As a median Australians are the wealthiest in the world and by some distance! So have we lost the generous spirit that we once prided ourselves on? Australia is forecast to cut its foreign aid to just 0.22% of Gross National Income (GNI) in the next few years. On the other hand you have Great Britain that has increased their Foreign Aid to 0.70% of GNI. If you compare the two economies shouldn’t it be the other way around? What does this teach the next generation of Australians about giving and helping someone that is not as fortunate as us? I was at the newsagent the other day in the queue to pay for the paper I was about to purchase and the people behind me where talking about how much they would love to win tonight’s Powerball lotto draw that was worth around 60 million or so. All I could do was think do these people realise that they have already won the lottery. By being lucky enough to have been born in Australia, and let’s be honest what country you are born into is a lottery, you are extremely lucky to have the freedom that we take for granted here. I would love to see more and more people take a step back and be grateful for what they have in life instead of always wanting more. The day you start to think that way will be the happiest day of your life. The other topic I plan to stand up and speak out about is Indigenous recognition and equality. We have just “celebrated” Australia day and growing up it was an important day on my calendar. There was always cricket on the tele and I still remember as a 10 year old being in Sydney and watching bicentennial celebrations as a replica of the first fleet sailed into Sydney heads. I was thinking this was a united country celebrating 200 years of existence. It wasn’t until I got a little older and started learn a little bit about our history at school I started to question whether we should really be celebrating our national day on the day the first fleet arrived. The more and more research you do on the history of white man’s settlement here in Australia you start to draw to the conclusion that this probably should be the last day we should celebrate it. I hate to use this word but there is no doubt there were acts of Genocide against the Aboriginal people. I hate to think this happens anywhere in the world let alone my own country. How can we expect to be a united country when we are asking the first Australians to celebrate the day that white man arrived and tried to wipe their race off the face of the Earth. Just stop and put yourself in their shoes for a minute. The hurt and pain we have caused them since 1788 can never be repaid. Yes we do have to move on from the past but being a white Australian I don’t think we have done enough to right the wrongs of previous generations. (If you want to hear a powerful depiction of these wrongs then watch Stan Grant’s video) The first step is to recognise the Aboriginals in the constitution as the first inhabitants of the country – something they have been lobbying the government for many years. We also need to change sections 25 & 51 that still permit race discrimination. Do we really need a referendum for this costing millions of dollars; surely common sense can prevail here. The millions saved could be better used in Aboriginal health care programs. It is hard to believe that Australia is the only developed country that still has Trachoma, a debilitating eye disease that causes people to be needlessly blind and can be fixed by a simple operation – never heard of it? Well that is probably because it only affects our Indigenous population so doesn’t get mainstream attention! In order to have anything to celebrate we MUST recognise the FIRST Australians in the Constitution. I would love to see the day that the Aboriginals are recognised in the constitution become the new Australia day, a day we can all celebrate together. We would then truly be able to celebrate being the lucky country and all that is great about this wonderful continent… together. By using my voice to educate, promote, inspire and debate, I hope to help lift more people out of poverty and make the world a better place. I hope you will join me.